Have you discovered shortcuts to capturing pictures or posting comments or pictures, or tips for cam viewing? Please share them with everyone here. Also, if you are wondering if there is a more efficient way to do something relating to posting, ask here, & maybe someone knows a better way! Great thread Nancy. I think we have some experts on this subject here! FYI - I use PhotoBucket to reduce the size of my .jpg avatar file. In the Upload Images section of PB, just set the "Reduce to:" option to "100 x 75 (Tiny)" before you select your avatar image. After you upload your avatar in PB, it will be within the maximum dimensions for the forum avatar. As most of you who watch the Virginia cams know, there are problems with trying to watch the cams using Internet Explorer. IE keeps crashing. If you use another browser, such as Firefox, this doesn't happen. When you capture a picture on certain sites (Alcoa, for example), the picture that you post ends up being way too large unless you take time to run it through a photo editor to resize it. Beth gave me a tip that I would like to share that will alleviate the huge picture and doesn't require that you run it through a photo editor before PhotoBucket. 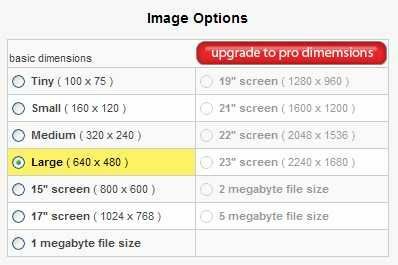 (a) For a one-time size selection, on the Upload Images & Video page, you can go to the "Reduce to" dropdown box and select the size you want your capture to be. **(b) If you want to select a certain size for a group of captures, click "more options" on the right side of the box. This will bring up the More Upload Options screen where you can select a size from a number of options. Once you select the option, remember to hit "save". **(b) option...We would like to have either size -med or large- for picture posting. Posting large pictures increases the amount of time it takes to upload to PhotoBucket, & also slows down the page loading process in the forum. If you know of a post that has given a good tip, please copy it & post it here or PM me & I will bring it here! Thx from all of us! Here's a trick I sometimes use to resize a picture....I resize it BEFORE I even capture it. If your browser is Internet Explorer (and I'm sure other browsers will do this as well...) reduce or enlarge the size of your page....then capture the picture. In IE you can do it one of 3 ways. 3. At the top of IE, look on your tool bar and find "page". In the drop down menu, select "zoom", and select your size. After you're happy with the size, take your picture..
SGB, what version of IE are you using? I have IE 7 & don't have the drop-down box you refer to, so maybe you're using IE 8? I'm using IE 7....are you talking about the drop-down menu from the "page" section or the bottom right? Actually, I use the Ctrl and +/- feature the most...I'll take a snapshot when I get home to show ya where I'm talking about..
OOPS! Now I see it on my taskbar...thx! Son of a gun--I didn't know that one! I'm using the minimize right now to view posts so that I don't have to use the scroll bar at the bottom of the page to read the posts! What a great idea catwoman! I just used apple and - (the Mac equivalent of CTRL and -) to minimize the posts here and reduce scrolling. I'd never thought of that before. Gosh...I had totally forgotten about the mouse wheel...thanks DEF...I think the reason I don't use that one as much is because I go crazy with the scroll wheel and before I know it, I'm up to 500%...its scary!! FYI: There is a "Mark Topics Read" and a "Mark Forums Read" link at the top right of most pages, so if you want to turn them off without reading, you can use that link. While not a posting trick, I thought this site might be helpful for folks who have many favorite sites saved on their computer. Foxmarks/ xmarks allows you to save all of your favorite websites on their website so you can access them if you are not at your own computer. I am always concerned about losing my long list of favorites if my computer crashes. This website provides you with a backup. Once you have signed up, it will automatically update any websites you add to your favorites list. Thanks, Obxbarb! Beth had posted this link before & I went back to look for it later but couldn't find it. Now I can get my bookmarks moved! If someone posts a link and does not convert it to the falcon button, you can still open it in a new window if you wish. Just right-click on the link and select "Open in New Window."